TIGERLIM.COM: Where You Can Find Ostrich Egg!!! Never hear about that there is Ostrich egg selling in town here. Few days ago went to Louis's Trading (gadong abdul razak complex) to take my shoe there to fixing I saw two huge egg in a green basket. 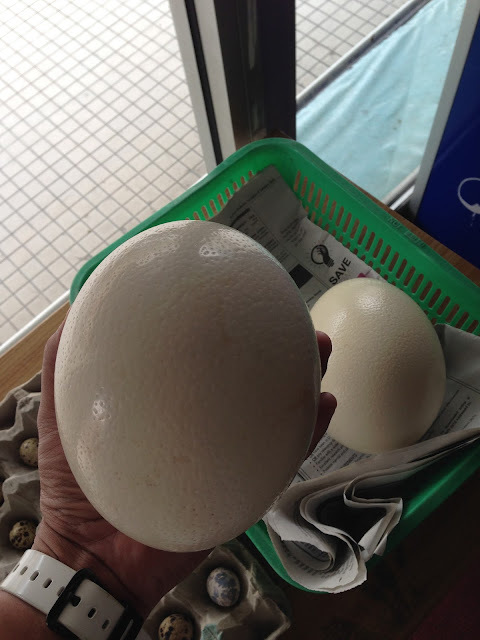 Then I realize that is a Ostrich eggs.. and I was for sell $18.00 each! This is also my first time I'm holding an Ostrich egg... It feel so hard, solid and heavy!! I feeling to buy one of that back home and let my kids play at home but at the second thought I didn't bought it home. Wondering how it taste but I have no courage to try... hehehe but some of my friends had tried it at other country. A single ostrich egg is equivalent to two dozen chicken eggs so if I cook this egg which mean I have to call up to 10 people come to my house and eat... Taste good or not good still don't know but they said it same taste like chicken egg too. Wake next time lah... if I call enough people come eat them I buy one and try cook it!